Here's a shot of me looking nice and SMASHED-which I wasn't, really. 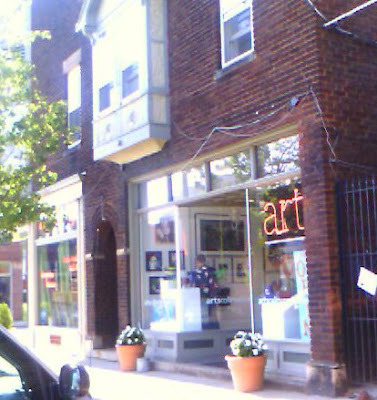 ...and a picture of the Arts Collinwood Gallery. My work will be there through September sometime... I really want to do some bigger paintings, but worry about the time & supplies they require ...not to mention all the smaller paintings I COULD have painted if bigger ones don't work out. Hope to take N and S with me and see your artwork soon. Great job! congratulations on your show! I love your work. 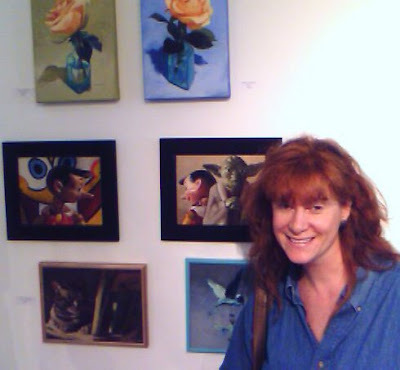 It looks like a nice gallery, thanks for posting the photos of the gallery and you and your lovely work!